The Ted Rogers School of Management (TRSM) Sales Team was crowned overall university champions at a U.S. sales competition earlier this month. Ryerson University’s team was the only Canadian team to compete against 22 schools at the Northeast Intercollegiate Sales Competition held at Bryant University in Smithfield, R.I. from Nov. 2 to 3. There are two main components in the competition, the main sales competition and the subsequent speed selling competition. Ryerson’s team, comprised of seven students and one instructor, cleaned up with a number of awards, including first and third place in individual sales, first place in speed selling and the overall university champion prize. “We had a strong, supportive team and were always hyping each other up throughout the competition,” said Kaitlann Silao, a third-year business management student. 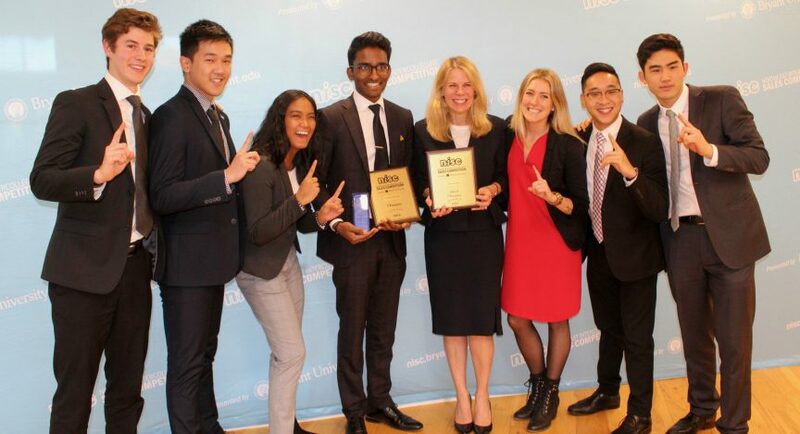 Fourth-year business management student Winston Devendrarajah won first place in the main sales competition and the speed selling competition. Sarah Oliver, a fourth-year hospitality and tourism student, won third place in the main sales competition. Competitors have 10 minutes to deliver a sales pitch on why they should be hired at a financial company during the main sales competition, which is in tournament-style. Following several elimination rounds, the final round is televised. The speed selling category is also run through an elimination process: 180 competitors are broken up into groups of six and each group has only one minute to give a sales pitch to a judge on why they should be hired. “Since me and Sarah didn’t have time to eat or take a lunch break between competitions, our teammates would be running all over to make sure we had food and water,” he said. Last year Ryerson had a small team attend the competition to get an idea of the experience, but he said this year was the first Ryerson attended with the intent to win. “We had just begun preparing for this [competition] three weeks prior, which was nothing compared to the other teams who had been practicing for months,” Sik added. The team has plans to attend the competition next year and is planning to do a lot more to prepare, according to fourth-year hospitality and tourism management student Tristan Broks. “[We will] be participating in local sales competitions, practicing Ryerson Sales Initiative and attending workshops to work on our skills,” he said. Great article, well written, well done team Ryerson! Great work Sam and congrats to the sales team!